General Civil Practice, Real Property, Commercial, Corporate, Probate, Civil Practice in all Courts, Commercial, Real Property and Probate Litigation. 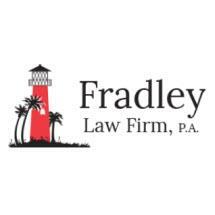 DONALD S. FRADLEY, born Miami, Florida, June 4, 1955;admitted to bar, 1980, Florida; 1983, U.S. District Court, Northern District of Florida; 1985, U.S. District Court, Southern District of Florida; 1989, U.S.District Court, Middle District of Florida. Education: Miami-Dade Community; University of South Florida (B.A., 1977); Florida State University (J.D., 1980). Member: The Florida Bar, Real Property, Probate and Trust Law section of the Florida Bar, Palm Beach County Bar Association, North Palm Beach County section of the Palm Beach Bar Association, North Palm Beach Bar Association, American Bar Association. Practice Areas: General Civil Practice, Real Property, Commercial, Wills and Probate, Business Organization, Litigation and Appeals in all courts. REFERENCES: Attorney's Title Insurance Fund, Inc.; R. J. Gators Franchise Systems, Inc.; Chasewood of Jupiter North Condominium Association, Inc.; and SunTrust Bank.